The Flex Savings Plan is designed to help budget your large annual fuel purchase by making it easier to save. It allows you to make a monthly deposit in any amount you choose, enabling you to budget your wood pellet fuel purchase over many months - instead of a single large one-time payment. Think of it like a Christmas Club savings account; but one you use for your wood pellet fuel instead of presents. Enroll By April 30th and Receive Free Value Delivery! *Requires a minimum of 3 months of savings. Order minimums do apply. Flexible - you choose the amount and duration. Personalized - you decide how to fund the plan. No commitments; cancel or suspend at any time. Payment confirmation emails and account updates. FREE Value Delivery on your next order of 3 or more tons (if enrolled by April 30th). Call us at 1-800-735-5387 and one of our fabulous customer service folks will walk you through the process. Q: How much should I save each month? A: Based on an estimate of the number of tons your burn annually, the average cost per ton for the grade of fuel you prefer, and the number of months you wish to budget for - we can help you estimate your monthly savings amount. Q: How do I fund this Flex Savings Plan? A: You may choose between using a credit card or your checking account. Your monthly deposit will be automatically processed each month. Q: Can I change the amount, or the number of monthly installments? A: Yes, if at any point you wish to change the amount you save each month, or the length of the plan, simply contact us and we'll make the desired changes. Q: What do you mean by 'delivery priority'? A:While you won't get next day delivery, we will bump your order to the front of our delivery queue. So during peak season when delivery lead times can grow to be many weeks, we'll prioritize your order and reduce your delivery lead time. Note, delivery priority depends on product availability as well as the discretion of our delivery coordinator. Q: Can I receive my fuel before accumulating enough credit to pay for it? A: No, all orders using Flex Savings Plan credits must be paid in full at the time the order is placed; future Flex Savings Plan payments cannot be applied to an existing order. Q: Can I still take advantage of other promotional pricing or specials? A: Promotions may not be combined. However, if your order qualifies for another promotion at the time you place it with us, we will apply the promotion with the greater value. Q: Can I change my mind and ask for a full refund? A: Sure. We'll refund all you money back minus a 5% electronic handling charge. Q: How many tons do I need to purchase to qualify for the free delivery? A: To qualify for free delivery you must meet the minimum order size for your area. Q: Can I place my order now and apply Flex Savings payments to the order? A: No, Flex Savings is for future orders only - and we are unable to apply future payments to current orders. 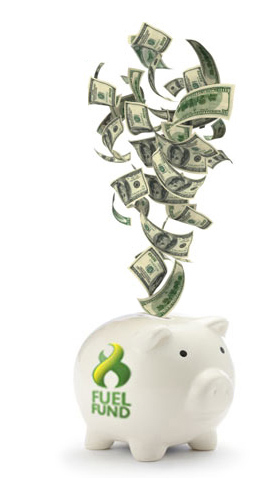 The minimum amount to participate in this Flex Savings Plan is $25 a month. All orders using Flex Savings Plan credits must be paid in full at the time the order is placed; future Flex Savings Plan payments cannot be applied to an existing order..
Email payment confirmations will get sent following any payment. 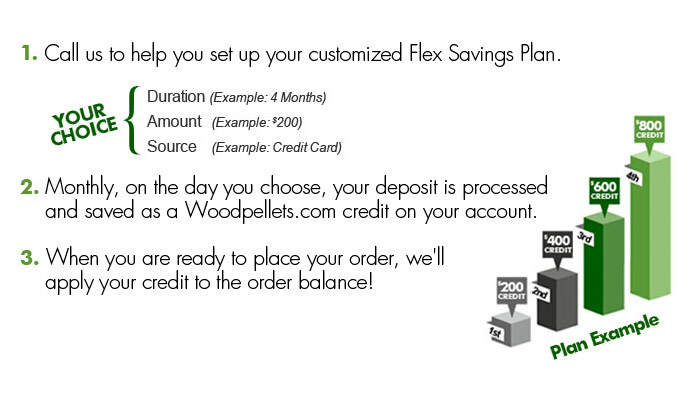 Flex Savings Plan credits will automatically be applied to any purchases from WoodPellets.com. A 5% electronic handling charge will be applied to refunds on credit balances. After two consecutive missed payments your Flex Savings Plan will be cancelled and the free value delivery offer rescinded. The customer understands that Flex Savings are solely for the purpose of providing a service to the customer to assist with the budgeting of their monthly expenditures, and in no way represents a contract for services or pricing.